Portions of this post were originally published on Crafting Fashion on February 23, 2015. A funny thing happened on my walk to the supermarket today. The block north of mine was full of police barriers, multiple cameras, cherry pickers with big lights, and a crowd. Ah... New York Fashion Week. 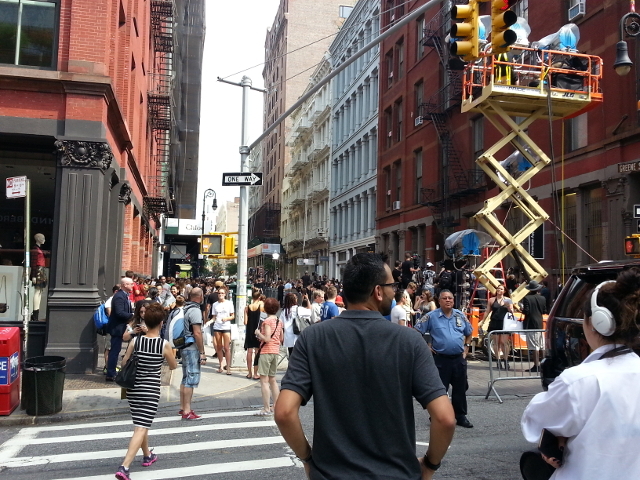 Rebecca Minkoff was about to have a runway show right there on Greene Street. Yes, New York Fashion Week has begun, but did you know that September 2016 is the first ever New York Textile Month (#NYTM)? (It's always New York textile month as far as I'm concerned. ;)) Nonetheless I've fully embraced this month's designation and will be doing my best to participate in both official and unofficial capacities. According to NYFM's initiator Lidewij Edelkoort, Dean of Hybrid Studies at The New School, NYTM is a a month to "investigate and celebrate the survival of different textile components and expressions... helping the general public to better comprehend and embrace the textiles of life." Yeah, I can really get behind that. If you'd like to know why a special month would need to exist, please read Edelkoort's complete mission statement. And this page will direct you to the lists of New York Textile Month events, if you happen to be in the city. My first visit to an official event was to the conveniently located Goodman Lobby of the Museum of the Fashion Institute of Technology. This exhibit was presented by F.I.T's Textile/Surface Design and Fabric Styling Departments. I was only slightly disappointed that there was not a single knit stitch on display. 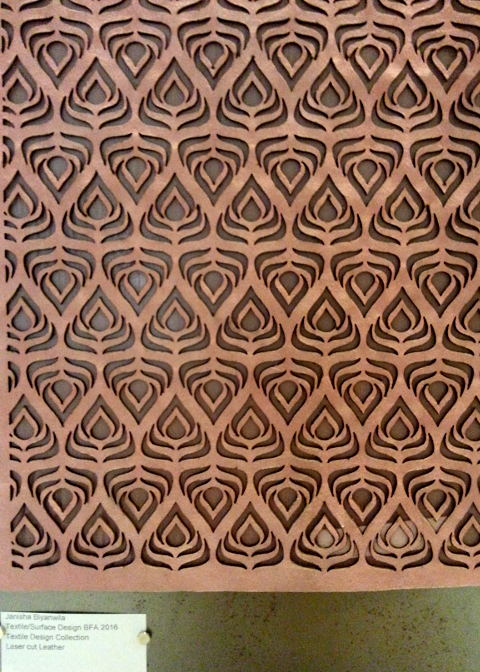 My favorite textiles were the laser-cut leather by Janisha Biyanwila (pictured above) and the monofilament and cotton by Rebekah Bassen (detail, below). It was impossible to capture in a photo the shimmery, diaphanous quality of Bassen's fabric, hanging as it was behind glass. I'd love to have seen this textile draped somehow in the exhibit. 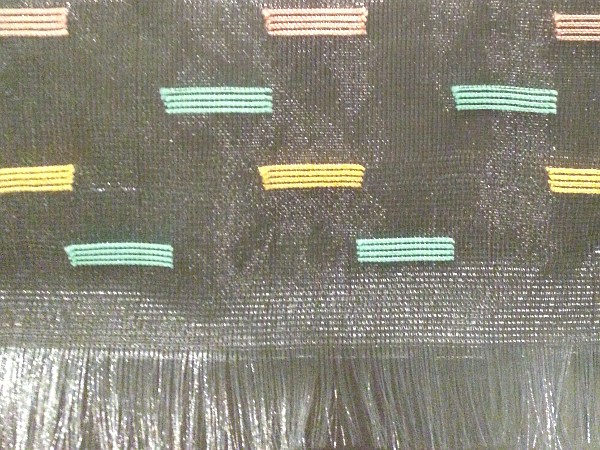 Both of these pieces are implicitly contemporary textiles, produced with methods (Biyanwila) or materials (Bassen) that weren't available a century ago. Many of you know it took a little while before I found a place where I could get my knit textiles produced. One hundred years ago, things might have been easier. Believe me, I have no interest in going back a century. I'd have major social justice issues, civil rights issues, and fashion issues. But one hundred years ago, my current SoHo neighborhood was a real hot bed of wool, sweater showrooms, and the knitting related businesses. These enterprises spilled out way beyond my immediate neighborhood. In fact, knitting mills were scattered all over the U.S. northeast and midwest at the time. Many of these businesses are documented in Sweater News: The Journal of the Sweater and Fancy Knit Goods Trade vol. 5 (12 issues from 1918), a publication, digitized on Google Books, that I've been "thumbing" through. Earlier and later volumes are also available, but I happened upon this amazing volume first. I'm not sure when the journal ceased to be published. The most recent one I found was 1920. A beach cover-up? Click to enlarge. 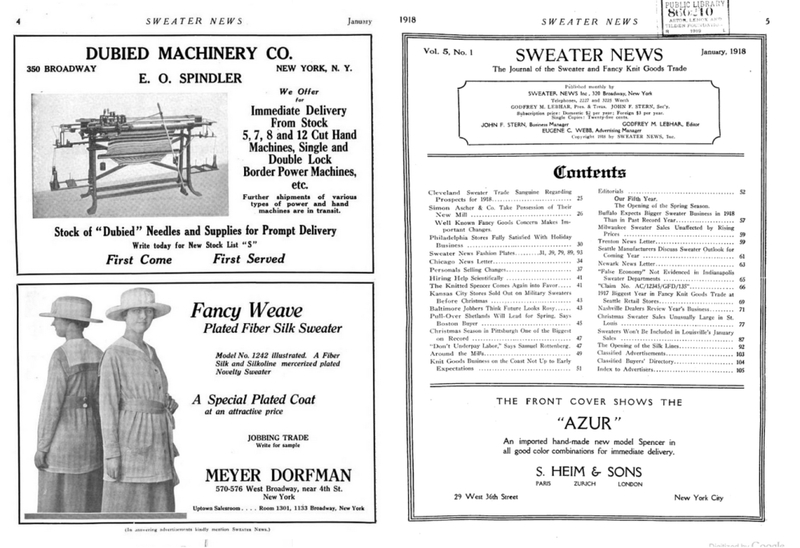 Sweater News was a trade publication for the wholesale sweater industry. I was already reading the articles and enjoying display ads, when I realized that it was published at 320 Broadway in Manhattan, just a few blocks from where I live and work now. Please click to enlarge Sweater New pages below. I love the ad for the Dubied machine, pictured above left. The Fashion Institute of Technology still has several Dubied machines, not too different from the one pictured. I knitted on a Dubied when I studied "Weft Knitting Technology" in the late 1980s. I got to use one again in 2011 when I enrolled in "Knit Design Principles and Technology" as a refresher. 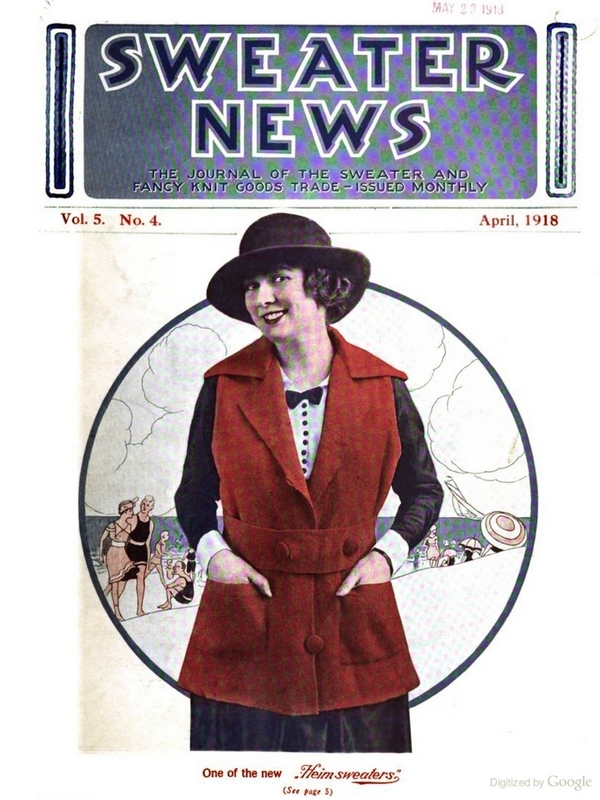 Ninety-eight years ago, wholesale buyers could browse the ads for the knit fashion of the day. "Climax Quality" bathing suits, anyone? The pages below got my attention. As I was reading "New Bill to Protect Designs Before Congress" on the right, I glanced at the opposite page and noticed that the American Spinning Company's branch office and warehouse was located across the street from me. You may have seen 66 Greene Street caught at a distance in my #outmywindow series of pics on Instagram. 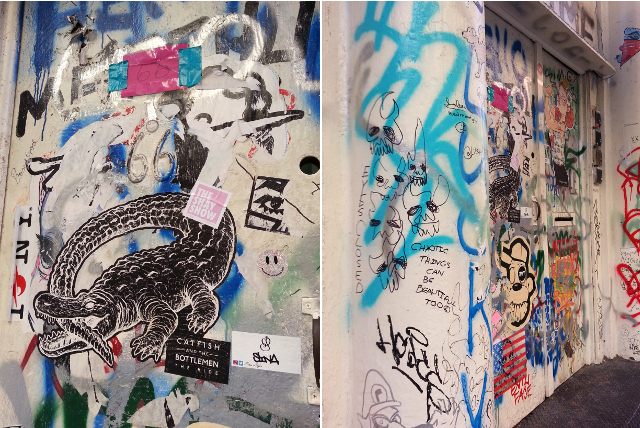 It's the graffiti doorway seen here and here. And below from two angles. The building was more pristine in February 2015 but photographed not nearly as often. 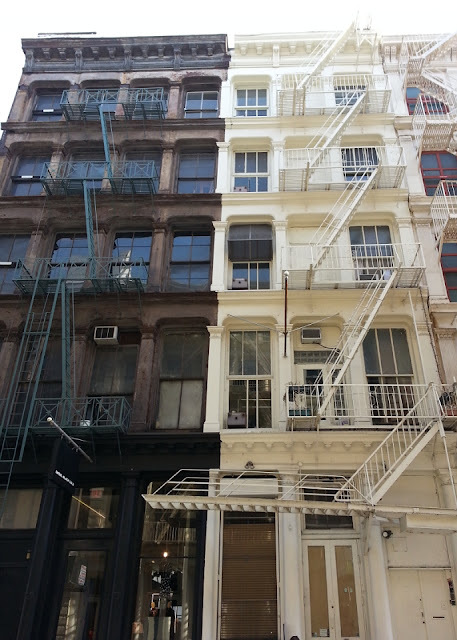 The building on the left (68 Greene) most recently housed an Oak & Fort pop-up shop on street level, but it's still the home of the Landau Wool Company, a remnant jobber, on the second floor. According to info gleaned online, Landau Wool was established in 1960, but I'd say it's a real throwback to the SoHo (before it was called "SoHo) neighborhood from 100 years ago. There are a number of very interesting New York Textile Month events I hope to attend. I'll be sure to post to Instagram, when I can. The O! Jolly! Shop will be celebrating NYTM, too. Join the list if you'd like to know when the specials are. Sweater News! What a cool publication! It's so interesting to catch a glimpse into textile history. Although, like you, I definitely wouldn't want to go back in time, and also, I reallly wouldn't want to wear those swimsuits (are they wool??? yikes!!)! Yup, wool!!! And stockings at the beach? Hahaha!